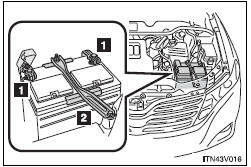 • If recharging with the battery installed on the vehicle, be sure to disconnect the ground cable. • Make sure the power switch on the charger is off when connecting and disconnecting the charger cables to the battery. • Do not cause sparks by touching the battery terminals with tools. • Do not smoke or light a match near the battery. • Avoid contact with eyes, skin and clothes. • Never inhale or swallow electrolyte. • Wear protective safety glasses when working near the battery. • Keep children away from the battery. Always charge the battery in an open area. Do not charge the battery in a garage or closed room where there is not sufficient ventilation. Wash the affected area thoroughly. If you feel pain or a burning sensation, seek medical attention immediately.